For a long time, perfectly executed brioche dough has completely eluded me. I don’t know what the problem is but I’ve tried two or three times (at least), and never once has the result been light and buttery as it should be. The first time, after the dough’s overnight rise, it looked like a big, hard lump, so I threw it out. That was my first mistake, because as I have come to learn, the dough needs a night in the fridge before it rises — it doesn’t actually rise in the cold. Oops. So then I made it again, and it came out of the fridge looking cold and lumpy, but I formed it anyway thinking it’d proof as it should once out of it’s chilly sleep, and it didn’t! So I baked one very dense loaf, which tasted pretty good, but wasn’t what it was supposed to be. Still, it was an improvement, and that particular failure became a phenomenal batch of french toast. Not so bad. So this weekend I came home, feeling like I’ve become too complacent with the things that I bake, and wanting to make something challenging, something different. And I know that to most, brioche dough is as simple as the day is long, but for me it’s a near impossibility! So I decided it was time to try again. After all, the recipe is so straightforward, if I paid enough attention, it would have to work! 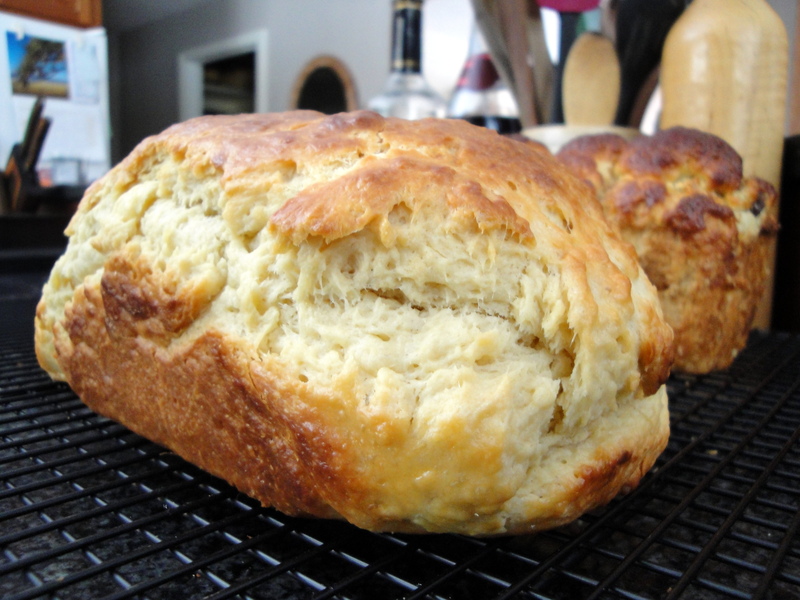 I went in search of the perfect recipe, and settled on Peter Reinhart’s Middle-Class Brioche. 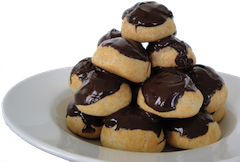 Most commonly made due to its moderate butter content, the recipe seemed easy, and the instructions couldn’t have been more straightforward. I followed the recipe word for word, not tweaking it at all like I usually do, and crossed my fingers and toes that this time it would work. And lo and behold, if you try long and hard enough, eventually you do succeed. The dough had that wonderful yeasty smell, and felt heavy with the weight of all the creamy butter. Once I was certain the dough had done its thing and was indeed on the right track, I decided to play with it a little bit, and use it in a variety of applications. I was tempted to try Pain Au Raisin’s, or Sticky Buns, but figured that this time, I should keep it simple. So I made two mini-loaves — one completely plain, and one as a play on monkey bread, with tiny little brioche balls rolled in cinnamon and sugar. YUM. 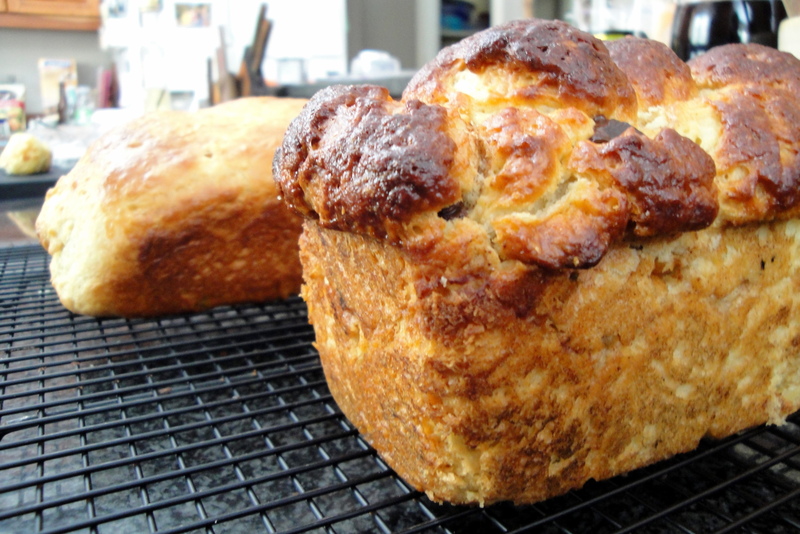 Then I made two larger loaves — one, again, completely plain, and the other, monkey bread stuffed with chocolate! I rolled out small balls, and stuffed them individually with semisweet chocolate chips, then rolls them up into balls and also doused them in cinnamon sugar. Needless to say, that came out delicious. And I had so much fun putting all of the components together! I found the recipe on Google Books, but it’s from Peter Reinhart’s book The Bread Baker’s Apprentice. It’s on my list of to-buy books, very close to the top! I’m very pleased with how all of my baking adventures turned out this weekend, and can’t wait to try them again. While the souffle worked, I totally messed up the recipe, so there’s tons of room for improvement and tweaking there, which to me is the best part of baking. And as for the brioche, this was only the first successful batch of many, many more to come, and I can only imagine the things in store! It’s such a wonderful, versatile bread, and I can’t wait to see what comes out of it in the future. Now that it’s been four months since my return from Down Under, this baking bug seems only to grow stronger every day, and I love it! I’ve never been so happy, so excited for the next recipe, and so fully engrossed in something before. It’s positively fantastic. With love, sugar, and lots of smiles. Enjoy!